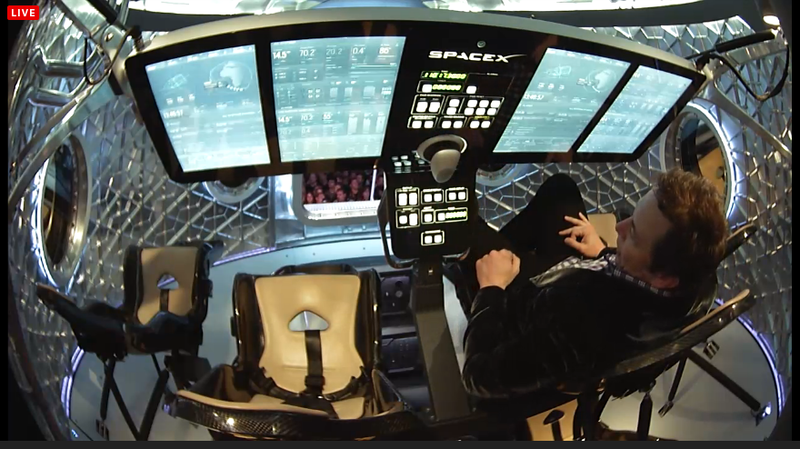 This evening Elon Musk unveiled the next version of the Dragon spacecraft designed to take crews to the International Space Station and beyond. 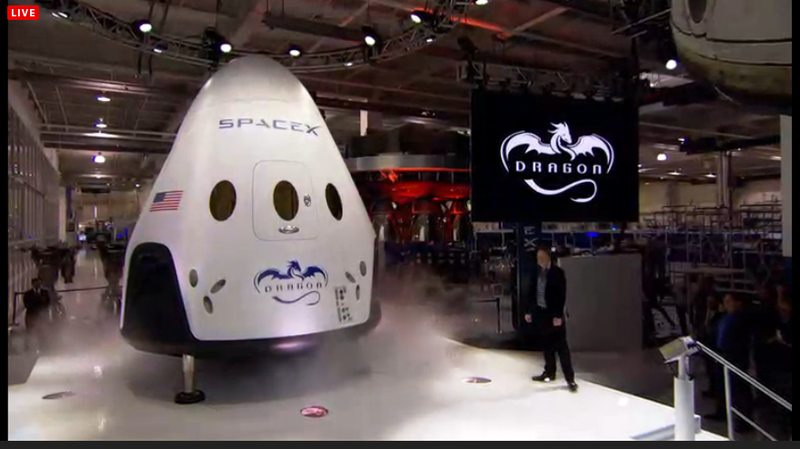 The crewed version of Dragon has undergone quite a transformation from the first version which was hanging above the crowd during the unveiling. The spacecraft is much bigger then before, has SuperDraco thruster which will serve both as an Emergency Escape System should there be an issue during ride to orbit as a propulsive landing mechanism allowing the crew module to return to land at the completion of it’s mission. 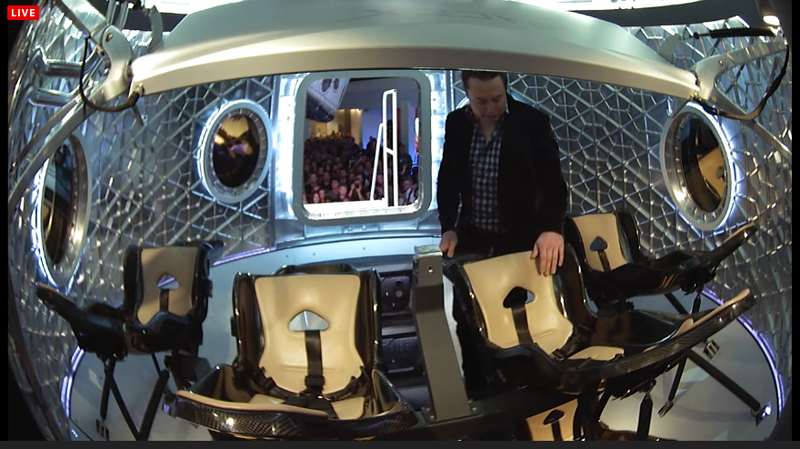 The crew module can carry up to seven passengers and the interior has a very modern looking interface with touch screen technology, with critical functions being available as button’s for emergencies. The touch screen interfaces with emergency manual button interface in the middle. Elon also said that with the addition of the SuperDraco thrusters it is now possible for Dragon to land anywhere in the world with the accuracy of a helicopter. During the reveal Elon explained that the spacecraft still has parachutes which would be used in the case that the SuperDraco engines failed during landing. The spacecraft has been designed to be fully re-usable and once landed should only need to be re-fueled and attached to a Falcon 9 rocket to fly again. As part of this Elon revealed that they are now on version three of there heatshield technology which will further reduce the damage of re-entry. During the animation demonstrating the abilities of Dragon V2 we saw the spacecraft docking to the station using the same mechanism that the Space Shuttle utilized. 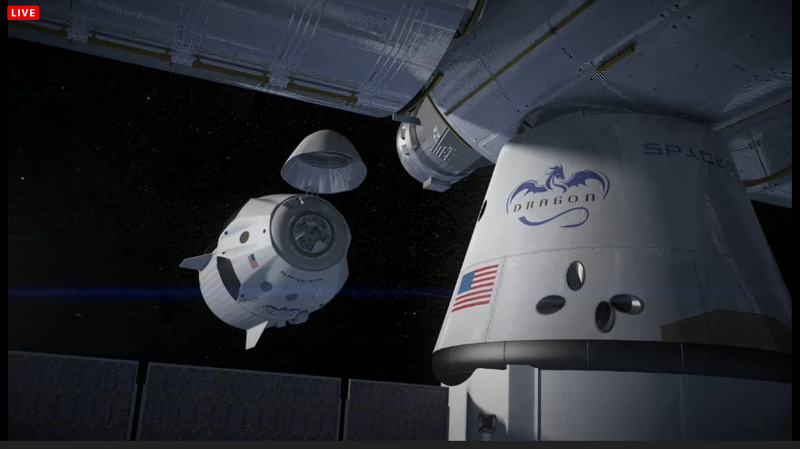 There was also a cargo Dragon attached to the station when the new version arrived. Elon also explained that the SuperDraco thrusters were 160 times more powerful than the Draco thrusters that are used to maneuver when in space, there are four pairs on the vehicle and each is isolated so a failure won’t cause problems for the other. He also revealed that the thrusters were fully 3D printed. Unfortunately there wasn’t a question and answer time during the presentation and no detailed about when the first flight will be. Below are more images captured of the unveiling.